How do you take blood from a Tasmanian devil? So - how do you take blood from a devil? The first step is to catch a devil! We try keep this process as stress free as possible, but it usually takes two keepers to make it happen. Once we have them, we’ll place them in a hessian sack for their (and our) safety. Hessian sacks provide a dark and safe area for the devil to relax in. Some of our devils recognise that special treats can come after a trip in the sack, so aren’t too bothered going in. We then take them up to our preparation area where the Menzies' vets get to work. As these guys healthy devils who have never been exposed toDFTD, the vets don't have to work wearing gloves like they would with any wild devil. They do follow strict hygiene standards, of course! The devil’s wellbeing always comes first for us and the vets - so to keep them stress-free the vets put them under a general anaesthesia while they are still in the sack. Once they are sedated, the vets can then remove the devil from the sack and continue with their work. They can also use this opportunity to do a thorough health check on our devils to make sure all is well and any wounds (from their love of scrapping) are healing well. I’m not sure if you’ve tried to inspect a graze on a devil’s face while they’re awake, but let’s just say they’re not fond of the attention! Then it’s down to business - the blood sample. Feeling for the jugular vein - it should be noted that the scar tissue on the face is from fighting (very normal behaviour) and not related to DFTD -- as mentioned above, our devils have never been exposed to this disease. 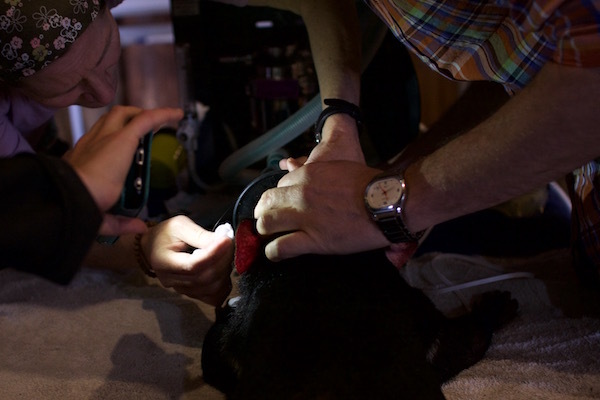 The vets will aim to get blood from the jugular vein, which they are feeling for in the above photo. If they can’t use the jugular vein, there is also a vein under the tail which can produce the blood needed. Don’t worry - we won’t show you photos of blood, but the vets only take one vial. The devil is then placed back in their sack and given time to recover from the aesthetic before being returned to their enclosure. All up, the procedure takes around 10 minutes - so it's a pretty short trip for the devils, and they're often none the wiser. Once the pack up is completed, the amazing vets can then take their samples back to the lab and keep the research going. Our thanks to the Menzies’ Tassie Devil Immunology Research Group for letting us share this with you, and for their amazing work.